distribution Present over most of the mountains, throughout the Piedmont, and in the northern Coastal Plain. Seemingly absent from the southern Coastal Plain counties, except in the Sandhills region; no records east of Gates, Beaufort, Harnett, and Scotland counties. Probably occurs in all mountain counties, but recorded so far only in roughly half of the counties in that province. abundance Generally uncommon but widespread in the Piedmont, somewhat less numerous than the Mocha Emerald. Rare to uncommon in the northern Coastal Plain and the Sandhills, but rare in the mountains. flight Primarily the summer season, to early fall; generally from late June or early July to mid-September. habitat As with other emeralds, it breeds in small forested wetlands, such as small streams and seeps. behavior Males may be seen flying patrols over the small streams, more easily noticed when the streams are becoming dry. Adults typically forage away from water along wooded roads, edges, and small clearings. 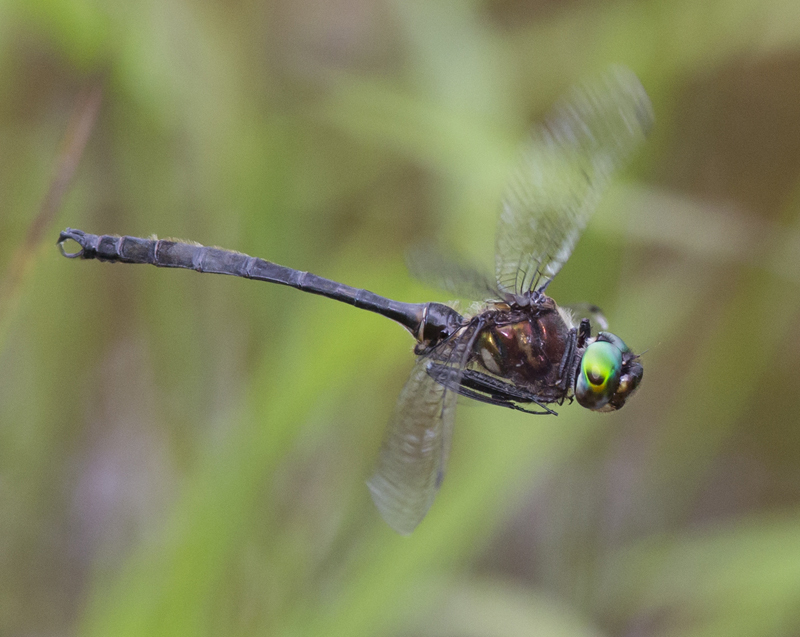 They perch on twigs in the shade, often higher than does the Mocha Emerald. comments The male cerci are indeed "clamp-like" when seen from the side, rendering identification somewhat easy when seen well. Also, this species has stripes on the sides of the thorax, whereas Mocha is nearly devoid of such markings. Clamp-tipped and Mocha are the only emeralds normally seen in the Piedmont; even so, because emeralds perch in the shade, often not in conspicuous places, many persons have trouble becoming familiar with this group of dragonflies (even though members of the genus are collectively numerous in much of NC).